Heinz Mack is one of the most renowned contemporary artists of our time. 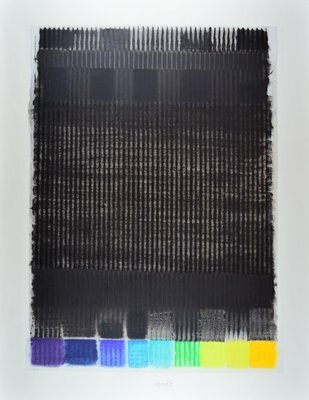 With his abstract artworks and editions Mack reduced his complete works on essential components such as light and colour. If you are interested in the procedure, the technology and the vision of Heinz Mack, we would like to show you a short introduction into the artistic work of him. His complete works consist of sculptures, paintings, photography and original prints and graphic reproductions. In 1957 the ZERO group was founded, which gave direction to Mack. The artists Heinz Mack, Otto Piene and Günther Uecker joined together to proclaim the hour zero of art, to question the conventional understandings of art and to show new ways of dealing with it. Their thoughts on a different kind of art were interpreted by the three artists on the basis of experiments with light, dynamic and different materials. At this time, it was Mack’s aspiration to investigate different sources of light and to display light as a central artistic element with all its facets. So he created numerous kinetic sculptures and paintings, which dealt with light appearance and reflection. To explore the deeper characteristics of light, Mack conducted a lot of expeditions away from civilisation. Mack’s interest was the pure, unused light that led him into the remote African desert regions and Antarctica. With the help of mirrors, sand reliefs, glass and cubes he experimented and realized his Sahara-Project in 1959. He explored the medium of light and the pristine desert and tried to produce a tension between these two components and to observe how they interact. He was interested in giving his works a new space and therefore took on a more spontaneous approach on art, which was mainly influenced by nature and its movement. 17 years later Mack travelled to the Arctic in order to implement his sculptural artworks. Also in the Arctic, light was understood as a medium and it was included in the experiments with nature. Through Plexiglas, light floral, ice crystals and other materials he created sculptural works in the mere nature. For Mack it was important to represent freedom with his projects, which would express his concept of Land Art. 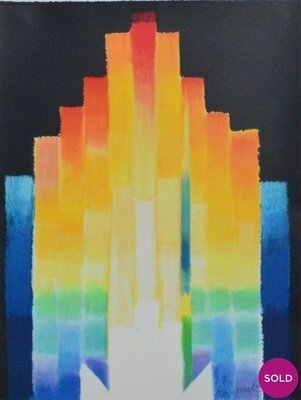 His artworks and editions are besides the pure exploration of light and colour mostly dominated by his sculptural complete works. The versatility of materials, such as wood, stone, plaster, metal, ceramic, sand or glass distinguishes his sculptural work. Also here he dealt with the topics light and movement. With the help of these concepts he defines new exhibition spaces. Thereby he gives them a new dynamic by adding and reducing light sources of moving elements in the form of light reliefs and light stele. In addition, Mack also designed so-called monumental sculptures for a public space. In addition to his sculptural art Mack also consecrated himself to paintings and prints. In 1963 he stopped painting on canvases. 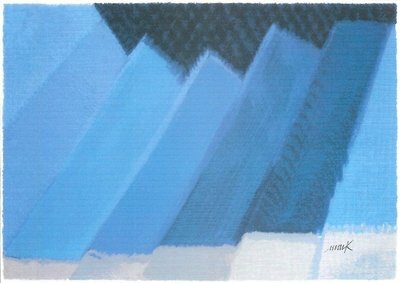 Only after 1991 he started again to create these kinds of paintings. At this juncture the work with pure colour and light was centre of his artistic contention. For Mack these to principal components of his art stood in an interdependent interaction. 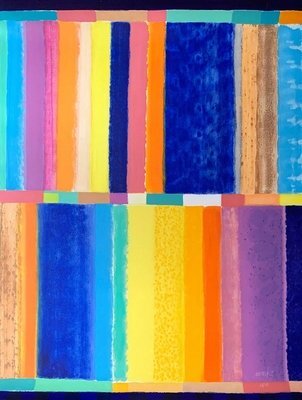 Based on intangible structures Mack developed in his paintings colour gradations, which showed expressive transitions and rhythms in his chromatic artworks and editions. 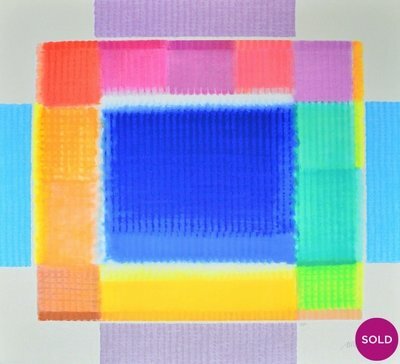 To give space to his abstract paintings, which are embossed with spectral colours, he used different forms like cubes, circles, squares and triangles. Both original prints and graphic reproductions dominated Mack’s graphic works. Besides his original prints ranked artworks and editions with Indian ink, pastels and watercolour. At the beginning of his artistic career he dealt with numerous graphic reproductions like serigraph on glass or prints with silver and gold stampings. Later he turned to classic graphic reproductions like lithography, screen print, xylograph and linocut. Through his position as co-founder of ZERO and his tireless efforts to promote their ideas of art, which were also expressed by many important international exhibitions, the artistic work of Mack just experienced in recent years a growing and increasingly steady recognition. This is also reflected in the long-prevailing constant high price level of his paintings and works on the international art market. 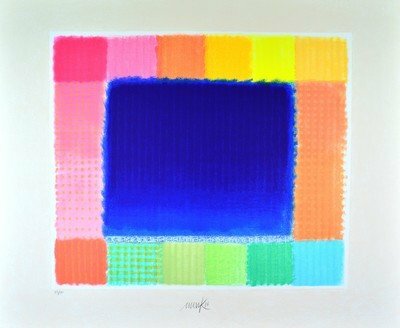 If you intend to buy artworks and editions in the form of prints and serigraphs by Heinz Mack, please contact us for any inquiries. You want to learn more about the artist? Visit Heinz Mack to get more details about the artist's works. 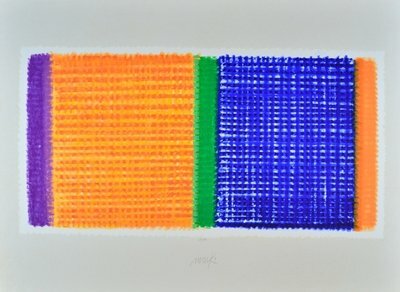 You want to buy artworks and editions of Heinz Mack, but you have further questions? We collected detailed information for this purpose.